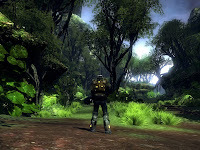 Earthrise is one MMORPG that isn't well known, but Bulgarian developer Masthead Studios want to change that. There's an interview of the Director of Masthead Studios at GameSNAFU, allowing us to know something more about the sci-fi themed game. Topics range from resource gathering to solo gameplay, among many others. There's also a couple of new screenshots there.